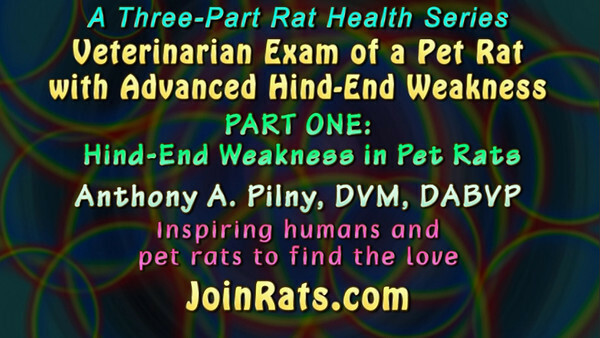 2 years, 7 months old, Retired Lab Rat, Number 11 is examined on December 15, 2009, by veterinarian, Dr. Anthony Pilny. After this exam, Eleven was put on a one week dose of steroids. The steroids did not help and were stopped. Number Eleven began showing signs of hind leg weakness in September that slowly progressed to the level seen in this video, which was filmed in early January 2010. Elevenee had adapted and was a happy ratty. Sweet Eleven, born 5/20/2007 - died, 5/17/2010. 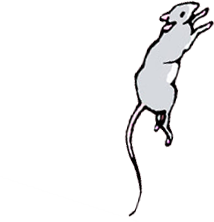 A fourth video is added to this gallery, an excerpt from Dr. Carolynn Harvey's exam of Bonny for hind-end weakness, because Bonny's symptoms were very mild compared to the advanced state of Eleven's legs, so we see some elements in the exam of Bonny that are not seen in the exam of Eleven.